Can violence in the region be stopped? Young people fleeing Central America's so-called Northern Triangle countries — El Salvador, Guatemala and Honduras — for the United States tell of life made unliveable by violent street gangs, stratospheric homicide rates, extortion threats and official corruption. 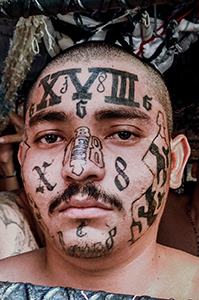 The violence has washed over into the United States, where Barrio-18 and MS-13 — rival gangs with roots in both Southern California and Central America — have committed murder and mayhem in Los Angeles and other American cities. Though Central American civil wars and state-sponsored death squads were major news in the 1980s and '90s, most Americans only became aware of the present crisis last year, when tens of thousands of young migrants — many of them children traveling alone — poured over the U.S. border, seeking asylum. The Obama administration is funding a preventive strategy aimed at curbing gang violence in Central America, a contrast to the enforcement-heavy “Iron Fist” approach used in the region, now widely questioned. Critics are skeptical about the new U.S. strategy, and few experts expect the crisis to ease anytime soon.